"I have recently had dealings with Onequote Direct when organising my motor insurance and received outstanding service from your customer service department. Please be assured that I will 100% be recommending Onequote Direct to anyone who has insurance needs in the future." If you are looking for a motorcycle insurance quote, you've come to the right place. As a visitor to the Onequote Direct website, you may have heard of our reputation for providing great insurance rates. 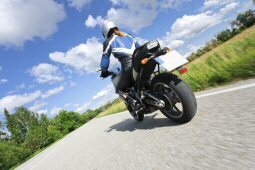 Now we'd like to be able to offer you competitive UK motorcycle insurance quotes too. As a proactive and leading provider of UK motorbike insurance, MotorCycle Direct could offer substantial savings on your bike insurance. Get a quote online or call our UK based team of insurance representatives to provide you with our best bike insurance solution. At Onequote Direct we work with a diverse range of insurance companies enabling us to offer a variety of car insurance solutions to suit a wide range of needs. One Quote Direct Insurance Services Ltd is an appointed representative of Europa Group Limited which is authorised and regulated by the Financial Conduct Authority. Europa Group Limited's Financial Services Register number is 309794. Registered as a limited company in England and Wales No 5479983. Registered office: Europa House, Midland Way, Thornbury, Bristol, BS35 2JX.